The balcony summer hotspot is the air conditioner, almost always on and blowing hot air. This summer, I’m enjoying succulents which seem fine on top, but probably not in front, of the a/c. They have fun colors, shapes, and even textures. 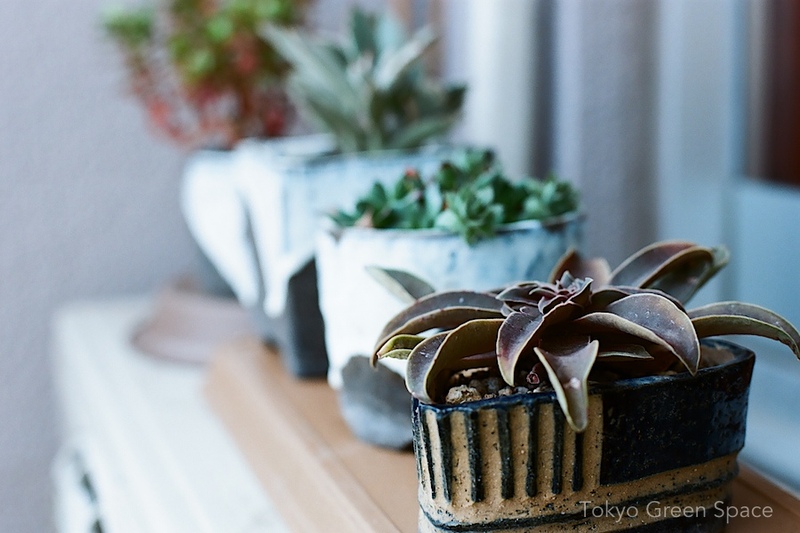 The ceramics were made at Kuge Crafts. These were some of the first ceramic flowerpots I made at my in-laws studio, Kuge Crafts. 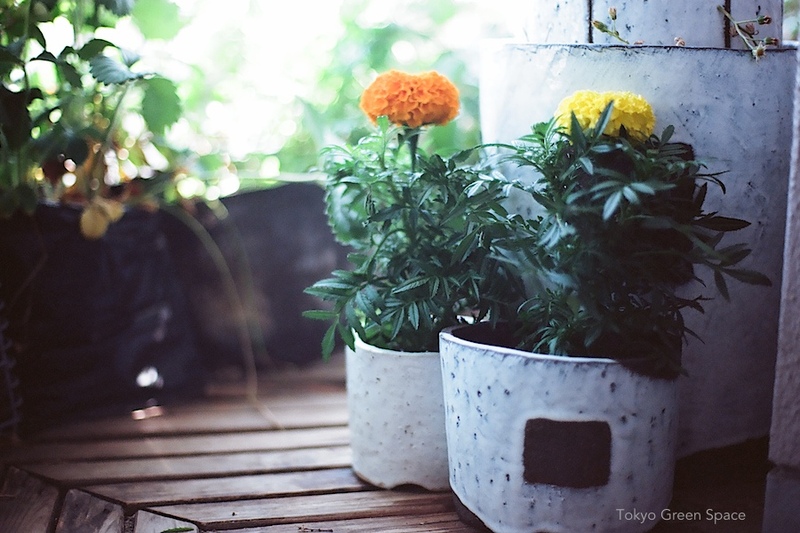 Here I’ve added some bright yellow and orange marigolds that I picked up at the nearby supermarket for 100 yen each. The ceramic are thick and heavy, which makes them ideal for a sometimes windy location. And the white glaze makes them easy to match with different flowers and herbs. This sake bottle character is named Tokkuri Tokkun (とっくりとっくん). The Shiho ceramic studio teachers and students each made one. I like Tokkuri Tokkun’s super-flexible limbs, particularly the one doing the splits. I like to have ready access to fresh herbs, and to use nasturtium flowers in salads. These potted herbs on the balcony are close to the kitchen so I can use them often. I love sensing spring’s arrival on my Tokyo balcony. First butterfly of this year, more birds, blueberry bush flowering, strawberries taking shape. African daisies on Tokyo balcony. This is the largest of the handmade ceramic pots I have made at Shiho studio. True horticulturalists like rare plants, or specialize in specific species. And garden snobs often like a constrained palette. For my own garden, I like a lot of color and don’t mind the most ordinary plants if they are colorful and hardy. 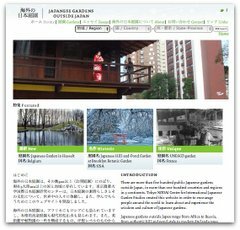 Still dormant persimmon bonsai on Tokyo balcony. Enjoying plants involves waiting. My balcony garden is starting to perk up for spring, but this persimmon bonsai is still dormant. I remember the day I brought it back two years ago. My neighbor asked me what I have, and then gave me a sad look. “You know it takes eight years for persimmons to fruit, don’t you?” she asked me. I am more patient than I look. White mini-daisies on Tokyo balcony. 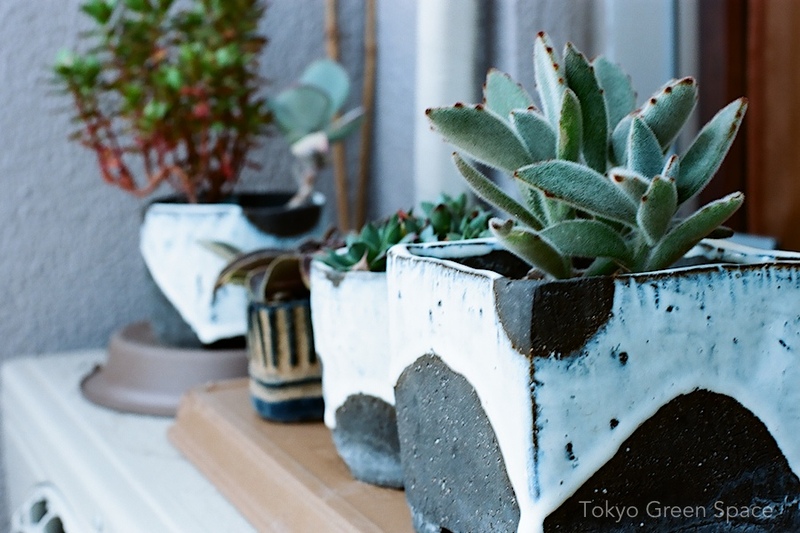 Handmade ceramic pots, all made at Shiho studio. In the background are tulips and succulents. I like mixing up things. Pink and yellow mini-daisies on Tokyo balcony. Handmade ceramic pot, made at Shiho studio. “Scabiosa blue balloon” sounds like a medical condition and hospital gift. Actually, it’s very fetching. This lovely lilac flower with an odd name, Scabiosa blue balloon, is one I don’t remember seeing before. It’s native to southeast England, and developed into a garden cultivar. I like to mix up nostalgic plants like daffodils with ones I’m not familiar with. Daffodils are very cheerful. Changing out the ceramic flowerpots. It was nice to re-pot my favorite hand-made ceramics with fresh flowers. I love daffodils for being so cheerful, with a high contrast between fresh green leaves and yellow buds.